Just as the range of mobile devices has multiplied, so too have the activities they can be used for. While men stand out for greater news consumption, women use mobile devices more for social networking on a daily basis. This stands out most on the smartphone. There, 53% of women use social networks daily compared with 39% of men. On tablets, the gap is 37% versus 31% for men. And on the smartphone in particular, younger age groups display a greater comfort level with small-screen reading. The 18- to 29-year-old owners are twice as likely as other age groups to read books on a daily basis. Additional data from the Pew Internet & American Life Project support this finding. Its December 2011 survey found three times as many 18- to 29-year-olds reading books daily on their smartphones: 12% versus 4% of 30-49 year olds and 1% of those 50 and older. Magazine reading (at a weekly rather than daily rate) is also more common among younger ages on the smartphone, though there, the division is between those under 50 and those 50 and over. The age differences in book and magazine reading are not significant on the tablet (though slightly higher percentages of 18- to 29-year-olds report doing this reading). Instead, it is household income that seems to be a key factor. Tablet owners with household incomes less than $30,000 have higher levels of daily book reading on the tablet than do those in higher income households (27% among those with household incomes under $30,000 versus about 17% for higher income households). 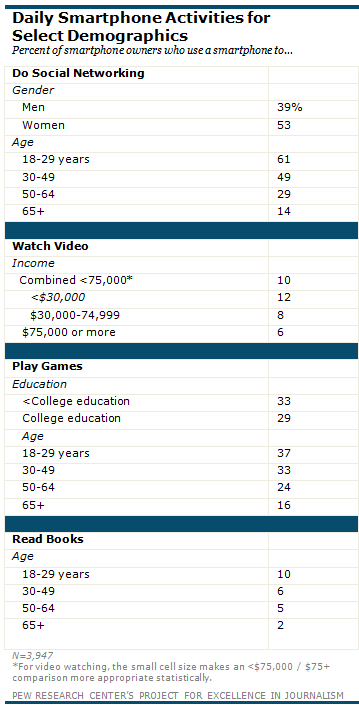 Household income also seems tied to video watching on mobile devices. On both the smartphone and tablet, owners in households earning less than $75,000 are more likely than higher income owners to watch videos daily: 16% on the tablet versus 9% among those earning $75,000 or more. On the smartphone, the gap is 10% versus 6% for incomes of $75,000 or more. Owners with lower household incomes, then, do both more book reading and video watching on their devices.